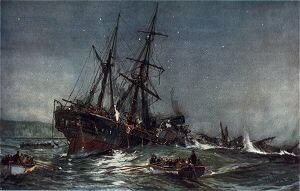 The wreck of the early steamship Birkenhead and the loss of 441 British soldiers, their families and members of the ship's crew off the Western coast of Africa in 1852, was long remembered as one of England's worst disasters at sea. The Birkenhead, one of the first iron hulled paddle-wheeled steamships in service for the Royal Navy, was steaming south to Algoa Bay with 634 passengers and crew members when it wrecked on a submerged rock off Cape Danger. The Birkenhead was under the command of Captain Robert Salmond, carrying reinforcements for troops fighting in the Kaffir Wars in South Africa, when it was wrecked on February 26. Among the troops on that trip were drafts of Fusiliers, Highlanders, Lancers, Foresters, Rifles, Green Jackets and various other regiments. The 210-foot steamer made a brief stop at Simon's Bay, near Cape Town, on Feb. 25, to take on fresh water and supplies, then steamed off into eternity. Captain Salmond had orders to "use all possible haste" to reach his destination, so the ship was steaming within sight of the South African coastline, an estimated three miles out to sea, and maintaining a top speed of about eight knots when it struck the uncharted and submerged rock. "The churning paddle wheels of the Birkenhead drover her on with such force that the rock sliced through the hull ripping open the compartment between the engine-room and forepeak. Water flooded into the forward compartment of the lower troop deck filling it instantly. Hundreds of soldiers were trapped and drowned in their hammocks as they slept." Survivors of the initial crash and flooding assembled on deck, many of them still barefoot and in their night clothes. Distress rockets were fired even though everyone knew that they were so far from normal shipping lanes that help was not going to be available. Captain Salmond gave the order to abandon ship and an effort was made to lower the lifeboats. Survivors said the davits failed to function properly because of a lack of maintenance and because a thick layer of paint clogged the mechanism. Two cutters and a gig were successfully launched and some of the survivors, including seven women and 13 children got away to safety. The horses were cut loose and thrown overboard in the hope that they might swim the long distance to the shore. The Birkenhead sank about 25 minutes after she struck, the only the topmast and sailcloth still protruding above the water. About 50 men were seen clinging to them, while the sea was filled with people, grasping for anything that would float. Many drowned and others were attacked by sharks. There was another ship, it turned out. The schooner Lioness came upon the scene the next morning, rescuing the people still alive in the water and even picking up those in the three lifeboats. Of the 634 people onboard the steamer, only 193 survived. The Birkenhead was built in 1845 and originally designed as an armed frigate. But an iron hulled ship was an innovation in that day and the British Admiralty had problems with changing, not only from wooden to iron ships, but from sail to steam powered vessels. Consequently the Birkenhead was consigned to be a troop carrier. 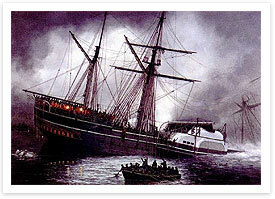 This was what she was doing when she was accidentally sunk in 1852. She was steaming for the Cape laden with officers, soldiers, horses and supplies that never reached their destination.